The first in the line of make and take classes! We will make an apron during this class. 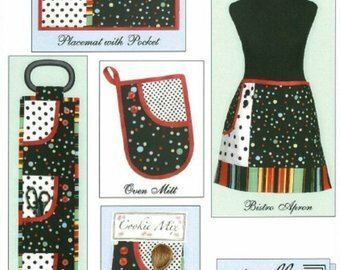 The pattern includes matching accessories for you to make at a later date! Class cost is $10 and will be on the first Saturday of the month. Klassy Kitchen Pattern available at the Byrd's Nest, 3/8 yard for main fabric, 3/8 fabric for pocket, 1/6 yard for bottom trim, 1/3 yard for binding and ties 1/2 yard for lining and 2 large buttons. Sewing machine and basic tools needed for cutting and sewing.